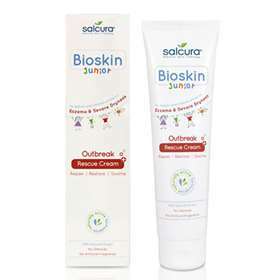 Salcura Bioskin Junior Cream, formulated for babies and children who have dry or eczema prone skin. Salcura Outbreak Rescue cream 150ml is a natural therapy for targeting flare-ups in children and babies aged 3 months plus with eczema or severe skin dryness. Salcura Outbreak Rescue Cream is 96% natural, and contains no steroids, or harsh chemicals that will further irritate delicate skins. Based on the Salcura best-selling Zeoderm formula, but with a gentler formulation for young and sensitive skins. Unlike steroid creams, there is no limit to the number of times it can be applied, and it can be used on the face. A highly effective product for severely dry and eczema prone skin, without long-term worry. With Linseed to reduce redness and inflammation, Borage to help the skin retain moisture, and Zeolite for its ability to eliminate free radicals. Salcura Outbreak Rescue Cream works quickly to calm and soothe dry, sore skin. Outbreak Rescue Cream is a natural alternative to steroid creams, and its innovative and cutting edge active natural ingredients ensure category leading result. Use the Outbreak Rescue Cream on top of the Daily Nourishing Spray when your child's skin is very dry and irritable. This will help to soften and soothe the immediate dry skin problem, while the Daily Nourishing Spray gets to work on the newly forming skin cells for longer term skin health. And because Salcura Bioskin Junior products do not contain steroids, they can be used on the face - great for dry patches on the chin and cheeks when teeth first push through, and for cradle cap and dryness at the hairline and eyebrows. For children and babies aged 3 months plus. Use on the face and body. For eczema or very dry skin. Aqua**, Glycerin*, Linseed/Flaxseed (Linum usitatissimum seed oil**), Urea*, Cetearyl Alcohol*, Olive (Olea europaea fruit oil**), Zeolite (minerals)**, Cetearyl Glucoside, Starflower Essential Oil (Borago officinalis leaf extract**), Castor (Ricinus communis seed oil**), Jojoba Essential Oil (Simmondsia chinensis seed oil**), Phenoxyethanol, Sodium Cetearyl Sulfate, Ethylhexylglycerin, Caprylyl Glycol, Echium (Echium plantagineum seed oil*), Palmarosa Essential Oil (Cymbopogon martini oil**), English Lavender Essential Oil (Lavandula angustifolia oil**), Rose Geranium Essential Oil (Pelargonium graveolens oil**), Damask Rose Flower Water (Rosa damascena flower water**), Citronellol*, Geraniol*, Phenethyl Alcohol*, Linalool**.